Your springs are the largest and also the most dangerous moving parts in your entire garage door mechanism. They are responsible for opening and closing your door thousands of times during their lifetime. Naturally, there will come a time when your springs will simply break. But, by monitoring their condition every so often, you can recognize some warning signs of your springs wearing out and can prevent yourself from major inconvenience or even serious injuries. 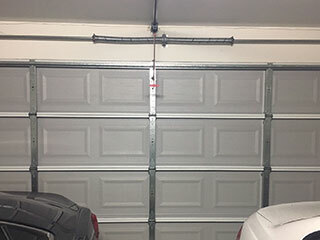 In most garage doors, there are two springs installed at the same time and it is very important to replace both of them, even when only a single one breaks. This will save you from calling us again in near future and will also prevent unsafe garage door practices which could damage your opener and other components. Garage door springs come in multiple weights and sizes and it is crucial to have the right fit for your mechanism installed. Our knowledgeable technicians will put the correct spring on your door to ensure a safe and proper operation of your system. We carry a large number of spare parts in our van and will in most cases install the corresponding spring on your door on the same day. After replacing your springs, our professionals will lubricate all moving parts to ensure proper working condition and will inspect and test the system to make sure it meets all safety standards. We believe we are responsible for providing a safe environment for you and your family and take our safety inspection processes very close to heart because of this. Therefore, you can count on us for the safest, most affordable, and most efficient spring replacement services in the whole of California. If your garage door starts acting up, give our team a call. We're the best service team around, and our technicians know exactly how to fix automatic systems of every make and model. Not only that, we also have a long list of products to offer you, including openers and new doors. Take a look at the rest of our website to find out more about our different services. Thank you for choosing our company! Feel free to browse our website for more information in the meantime. Our team at Garage Door Repair Canyon Country is at your service any time!